You make one of the more successful No-Budget films of all time against all odds. It is a horror film with no actors, minimal SFX and minimal story yet makes a comparatively huge profit (after a while at least), shows great visual flair and guarantees that the director will get at least a couple more cracks to prove it wasn’t a total fluke. That’s strike 1, whaddya do? Of course! You simply remake the film that made your name, only this time you tweak it just a little, spend a few more bucks and market it more as a horror-comedy. That’s what Sam and Bruce did anyway. As a side-note: When I first fell into the job/career (whatever) I have now in my mild-mannered everyday existence, I always felt really bad for every client I “helped” because I had precious little experience and was simply fumbling my way through things. Now a decade later I sometimes I wish I could go back and give them real assistance rather than the amateurish bluffsmanship that I justified somehow back then. So in short I totally understand Sam Raimi going back and saying let’s make this better! Rather than rehash the plot you can read what I said about the original HERE. 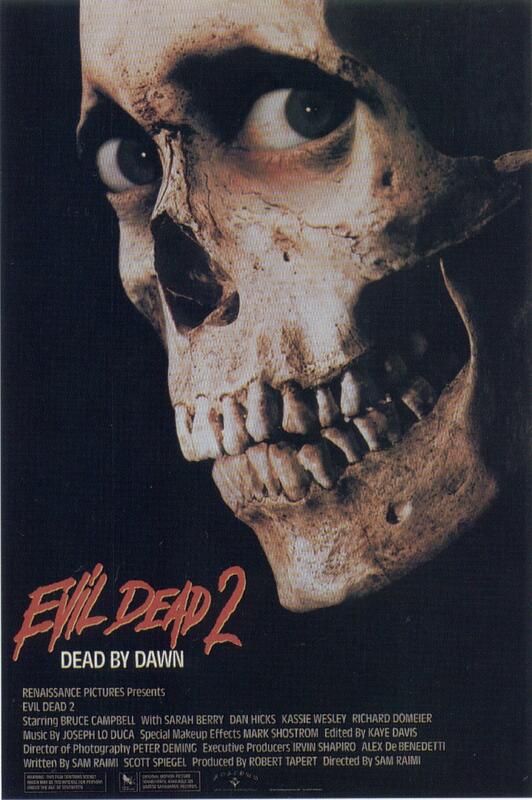 Evil Dead 2 is faithful to the basics, although this time it is only Ash and his missus Linda who venture to the remote spooky cabin. Once again they find the spooky tape and play it, leading to the same results and the Evil Dead being awoken and laying siege to the cabin. First to go is Linda, the poor girl and her subsequent corpse take a fearful pounding in this film, (and not the pounding she probably envisaged when she agreed to the dirty weekend). She is beheaded, buried, has her severed head beaten and stuck in a vice, before her body is chainsawed and also ultimately her head too. So apparently the Evil Dead only wake at night, handy to know, but night seems to fall within minutes of sunrise in this crazy backwoods place. Put another way: Ash and Linda show up in the daytime, she is offed overnight, Ash is possessed and awakens in daylight shortly before nightfall. The main action occurs over the duration of the next night and ends just before dawn, that’s between 60 and 70 hours of real time crammed into an 80 minute film! Anyway 4 new future-cadavers show up, a couple of rednecks and the cabin-owners creepy looking daughter and her jock boyfriend. (The redneck’s missus is by no means spectacular but she is wayyyyy out of his league!) What ensues is bloody, gory, inventive, disgusting, exhausting and quite frequently hilarious. There are a couple of brilliant scenes where Bruce Campbell gets to show off his physicality, the duel he has with his own severed hand stands out (you read it right). The fact that Bruce and Sam were best buds meant that Sam subjected him to conditions and torturous methods in order to make the violence and pain more believable, and no doubt to give Bruce the shits at times. The comedy elements have become pretty renowned and often copied, not the least by Sam himself in last year’s Drag me to Hell, but for sheer inventiveness you’d have to go a long way to see something as eternally cool as Ash’s reflection leaning from the mirror frame to grab him and talk to him direct. There is more blood than a Saw Vs Hostel boxset of DVDs, more laughs than a boxset of American Pie DVDs and more makeup than in a season 1 boxset of Keeping up with the Kardashian’s, although this time it is people being made to look like scary deformed psychotic monsters, and not vice versa. What is a loooooong night for all involved is a hilarious “eye-popping” 84 minutes for anyone lucky enough to watch it. 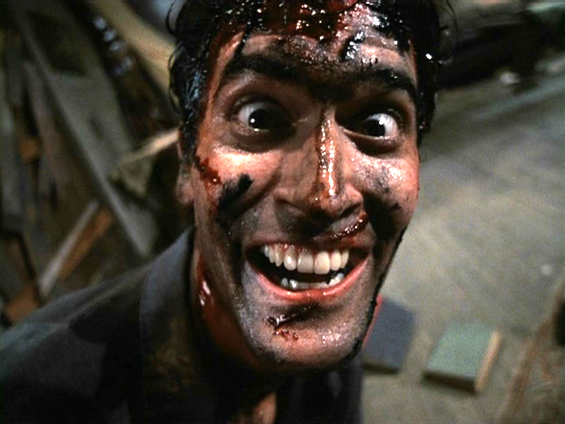 You also get to see a few little touches and lines that show how Ash will develop in Evil Dead 3: Army of Darkness, which further ramps up the comedy. But that’s for another time. For now Evil Dead 2: Dead by Dawn showed that Horror and Comedy could not only co-exist but thrive. Final Rating 9 / 10. Often ripped, never bettered. Not even by Mr Raimi himself.